Nimbus is the name for the master node. 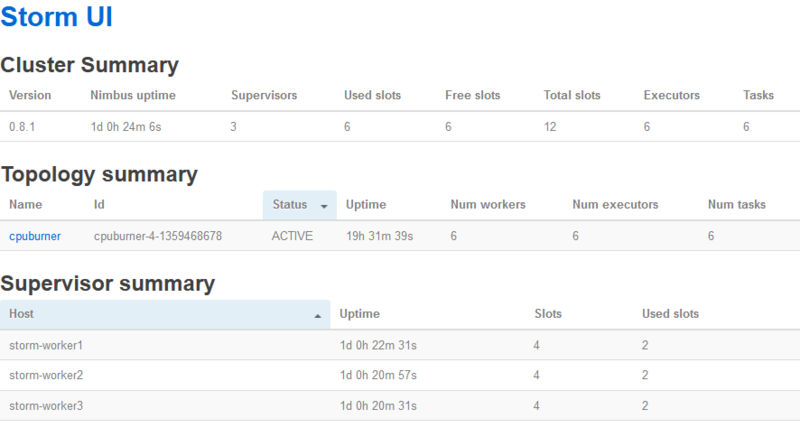 Nimbus is responsible for distributing code around the cluster, assigning tasks to machines, and monitoring for failures. The nodes that perform the work contain a supervisor and each supervisor is in control of one or more workers on that node. ZooKeeper is used for coordination between nimbus and the supervisors. We need to reboot the machine for this to take effect. We will now create a single ZooKeeper node. 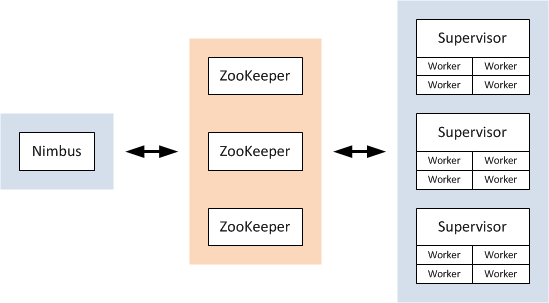 Take a look at the ZooKeeper documentation to install a cluster. Note that the screenshot also shows an active topology, which will not be available if you just followed the steps in this tutorial and haven’t deployed a topology to the cluster yet. The paramiko package adds SSH capabilities to Python and allows the Libcloud library to SSH into your nodes and perform initial configuration. In this post I will explain how to build health apps that use Continua Health Alliance certified health devices with NodeJS. To communicate with these devices I am using the D-Bus health service from the open source Antidote IEEE 11073 stack library. Signove, the authors of the Antidote library, did excellent work creating an open source software stack that can be used to develop health applications. They provided good developer documentation (PDF) that helped me a lot to get things working. The Antidote Health Service handles all communications with the health devices. I’ve only managed to get Antidote running on Linux but it supports more platforms, please refer to their documentation for more info on this. My health application itself is written for NodeJS and uses node-dbus to communicate with the Antidote Health Service. There are a couple of D-Bus modules available for NodeJS but node-bus was the only one that worked for me. I did not have prior experience with D-Bus programming and not all of the examples included with node-dbus made sense to me. I spend quite some time figuring out how to communicate with the Health Service via D-Bus. The python example, included in the Antidote software helped me out quite a lot. As for the health device: I tested my setup using a Continua Certified Omron body composition monitor(or, as you prefer: a weighing scale…). To be able to use the health service, an object should be registered on the dbus that will listen to messages of the health service. The code fragments below show how this can be done. First, require the dependencies and make some definitions. As I mentioned above node-dbus is used to communicate with the Health Service. The xpath and xmldom modules are used to parse the information that is received from the weighing scale. The weighing scale’s data type is defined by an integer defined in BODY_WEIGHT_SCALE. The information from a measurement event is received in an XML document. Within the XML document the body mass (weight) is identified by the value of MDC_MASS_BODY_ACTUAL. The following code fragment shows how to start using the dbus and configure dbus for using it with the health service. When the reference to the manager interface of the health manager is made, the health application can register itself as a listener to the health service. The code below shows how this is done. First we get a reference to the dbus registration mechanism and request a name on the dbus, in this case the name is org.servicelab.healthapp. Then a name is created for the object we are going to register, to make the name unique the process id of the currently running process is used. Then the methods that will be listened to are defined in the Methods object. All messages that are received from the health service will generate callbacks to functions that are defined in this object. An example of the Methods object will be given below. The Methods object is registered at the dbus using the objectName. The Methods object will implement the com.signove.health.agent interface. This concludes the registration of the listener. Only the Methods object needs to be implemented to get things working. The interface of this object is documented in Antidote’s documentation. Not all methods are implemented and the Continua device that I used did not support all features either. The code example below shows how to the device attributes of the device that is connecting and how to get the measured weight from the measurement data. When the device becomes associated with the health service the Associated function gets called. Within this function the device can be queried for its attributes. The device will answer this request using the DeviceAttributes functions. The device attributes are passed to this function as an XML document. Measurement data will be delivered to the application via the MeasurementData function. The measurement data is in XML format. In the above example is shown how to get the weight from a measurement using an XPath query. The source code is also available as gist. This configuration is used in a demonstrator of the Figaro project which demonstrates how IP-based and non-IP based home networks can be converged (PDF). This demonstrator is shown in the IEEE booth on the CES coming January. I wanted to control my Arduino via Bluetooth using NodeJS but I could not find a Node module to do it. That is why I decided to build my own. This post describes how to use it. First, lets take a look at the Arduino setup I am using. It is a simple Arduino Uno with breadboard. For Bluetooth connectivity I’ve added a Bluetooth shield. For testing purposes I’ve configured a simple layout on the breadboard that allows me to control a LED. The picture below shows the configuration. I wrote a simple schema to control the LED. The program can change the status of the LED according to the value that is read from the serial Bluetooth connection. The program also allows to read the current state of the LED. On the NodeJS side I have created a module that allows a script to communicate via a Bluetooth serial connection. The module can be used to communicate via Bluetooth as well as to search for Bluetooth devices and serial port channels. Currently the module only supports the Bluez Bluetooth stack on Linux. I might add OS X support in the future. supports both Linux, Mac OS X and Windows (thanks Elmar!). To use the module you’ll have to import it into your script. Below is a simple example program that controls the Arduino configuration described above. // bluetooth enabled Arduino device here. Currently the module works quite well. The only thing not working is when a script wants to reconnect the Bluetooth connection. When a connection is ended, for example when the Arduino is switched off, and the scripts starts a new Bluetooth inquiry the module will find the Bluetooth serial channel again but does not connect to it. My current work around for this issue is to terminate my script when a connection has ended and than restart the script again. To achieve this I’m using forever. I’ve used the above configuration to make a UPnP controlable Bluetooth lightbulb prototype. For the UPnP side of the prototype I used the upnp-device module. The prototype will be part of the Figaro demonstrator that will demonstrate how IP-based and non-IP based home networks can be converged (PDF). This demonstrator is shown in the IEEE booth on the CES coming January. All sources from this post are available as gist. Java WebStart, also called Java Network Launching Protocol (JNLP), allows you to launch Java applications directly from the internet using a webbrowser. In this article we will create a simple application and all configuration files necessary to launch it through Java WebStart. Java WebStart applications run in a sandbox with very limited default capabilities. The application can ask for extra permissions in the JNLP file, as can be seen in the following file. The JAR file needs to be signed for these permissions to take effect. We need to create a keystore file for that first. If needed you may change the alias and the keystore file name. Now run the ANT script (target signjar) and copy the resulting JAR file and the JNLP file to a directory on your webserver. Fire up a webbrowser and point it to the JNLP file. If all goes well, it will present you with a warning about permissions. Check yes and it will start the application. <marker id="arrow" viewbox="0 -5 10 10" refX="18" refY="0"
One of the main advantages of service engineering in Java is that there are quite a lot of environments, libraries, frameworks, IDEs and plugins to choose from. That’s also a major drawback. We ran into this while doing a recent prototyping project, and once again discovered the hard way that there is a certain threshold before you run into framework limbo, dependency hell and assorted related afflictions. There is a saying in Dutch about donkeys and bumping into the same stone twice. Our new general rule of thumb is that you should use never use more than about two (plus or minus one) environments, libraries, frameworks, IDEs and / or plugins at once. Ever. You’ll save yourself from being a donkey by using only the stuff you really need. So read on if you want to risk countless hours of frustration with Eclipse, Maven Google Web Toolkit and Lombok. 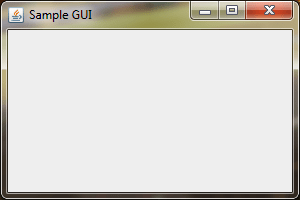 Disclaimer: we have switched to using another GUI framework which is more suited to our needs.